Terme Maribor as the biggest provider of MICE facilities in Maribor is actively building connections with their potential clients from the neighboring countries. Maribor is only a 3 hours drive away from Budapest, which might be the first reason for meeting planners from Hungary to organise events and incentives across the border. The second one would for sure be the difference in the landscape. Green and hilly Pohorje is attractive during the summer as well as in the winter. 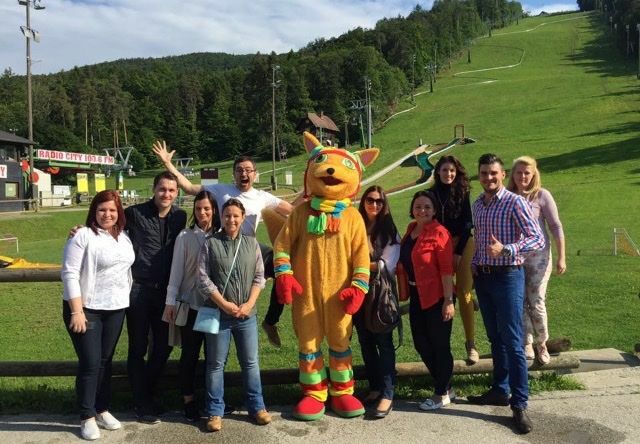 Meeting planners and event organisers from Hungary discovered Maribor on a 2-days fam trip. Relaxed stroll with the hint of history through the Old Town of Maribor was followed by the site-inspections of three main four-stars hotels, Best Western Hotel Piramida in the city centre, Hotel Habakuk at the foothills of Pohorje ski resort and Hotel Arena, located just beside the ski arena. Every January the women alpine ski championship “Golden Fox” is finishing just beside hotel Arena. A mascot Golden Fox was challenging the Hungarian guests with some team-bonding activities. The first day impressions were discussed along with the local culinary delights and wines in the restaurant “Pri treh ribnikih” (By Three Ponds).